An attorney and first lieutenant, Haeften serves primarily on the eastern front. 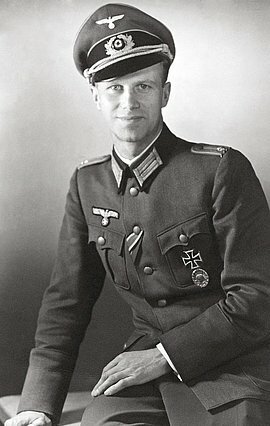 After recovering from being severely wounded, he is assigned to the staff of commanding officer of the Ersatzheer (Reserve Army) and serves as Stauffenberg's adjutant from November 1943 on. There he plays a key role in planning the assassination attempt. On July 20, 1944, Haeften and Stauffenberg fly to Hitler's headquarters in the "Wolf's Lair" near Rastenburg in East Prussia. Here Haeften helps Stauffenberg with the final preparations for the assassination attempt. After the bomb detonates, Haeften and Stauffenberg are able to leave the restricted area surrounding Hitler's headquarters under a pretext, and they succeed in escaping to Berlin by air. After the attempted coup has failed, Haeften is executed by a firing squad in the inner courtyard of the Bendler Block in the night of July 20-21, 1944, together with Stauffenberg, Friedrich Olbricht, and Albrecht Ritter Mertz von Quirnheim.